Yes, the wooden support structure (as long as it lasts) is visible in the earlier pictures of the fire; it will burn like mad, a great shame. Last edited by TLDNMCL; 15th Apr 2019 at 21:20. Reason: spelling error. Really? Initial fire-fighting held off? I think this would be contrary to all normal fire response strategies. Why would you hold off and let a fire take a hold and spread? If you are going to let people in at all to recover valuables then some water coming down on them is probably a good idea. But if there is a smoke risk then you wouldn't want them going in and needing valuable firefighters diverted to rescue them. Many of the paintings in Windsor Castle were worth over fifty-million at the time of the fire. More now. The big one (that they had to hide from the French during dinner) has an incalculable value. We, humans, could rebuild Notre Dame in 1/10 of the time it took to build it. Twenty years. It might be a symbol of how we can pull together when things are important enough. Have the conspiracy theories started? No, not held off but...carefully co-ordinated to seize interior treasures - (enabling real people to go in and get them) - some of which are priceless. Inundation with water at that stage could have ruined artworks below, endangered salvage attempts going on at ground level. etc. We, humans, could rebuild Notre Dame in 1/10 of the time it took to build it. Twenty years. Where are you going to find 16-20 inch oak beams in 40 foot lengths? When it is rebuilt, it will not be the same structure. Likely steel frame under an old-looking skin. This picture seems to show the roof remains burning on top of the vaulted ceiling in at least part of the cathedral. Getting the Oak timbers is not the problem. Plenty en France and in Britain. There is a fundamental difference between French oak and British Oak - some would even say it won us Trafalgar but let's not go there at this point in time; we're all friends joined by a mutual tragedy. The wood's not the lost bit, It's the craft - the preparing/ shaping and installing (those handed down skills) that folks have passed up in the race for glass and steel and USB plugs. That having been said - there is a very select band of Oakwrights - who will doubtless be called in. We will see this magnificent structure rebuild once more. Go and look at the (first!) Glasgow art school restoration. well the smoke is white, maybe there's a new pope? Slight thread drift, but goes towards response. Post Glasgow School of Arts fire #1, Strathclyde Fire Service released this timeline of their response. It is a little long, 13 minutes, but worth preparing a cup (or glass) of your beverage of choice and watching. Can't determine who was quicker to their keyboards, doubtless rubbing their hands with glee - the armchair experts or the usual Trump-bashers. Doubtless they'd lauded the idiotic suggestions of failing Hollywood types in the days after Macondo. Pathetically predictable. Back on Planet Earth, today the world indeed recorded a heartbreaking loss. 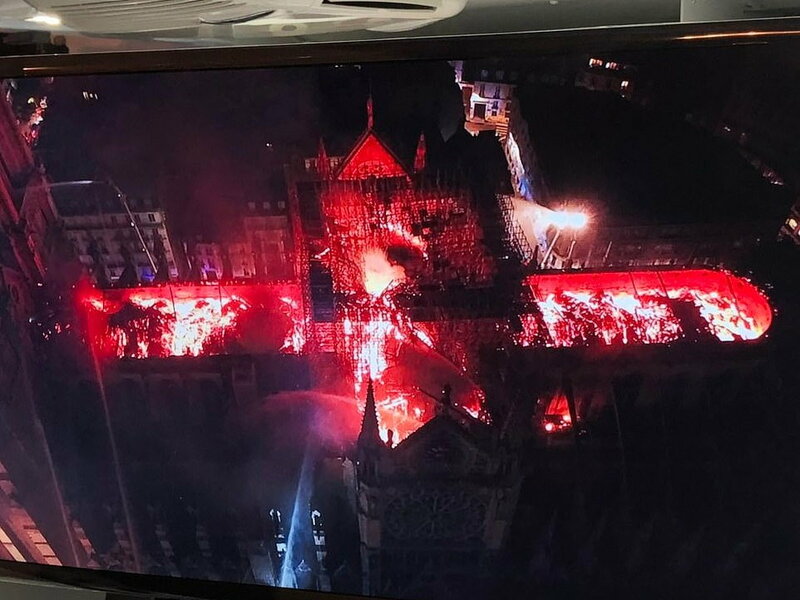 Looks like an appropriately aggressive (and ballsy) response from Paris Fire - aerial placement for one, and deploying crews up the bell towers while the structure was fully involved.... may have made all the difference. Earlier reports of one FF injured but nothing further. Thoughts are with them all - I'm sure a long night for many. An equally sad note is that while the sorrow may well be felt all over the world, it will not be universal. There will be a sizeable population of people who will openly and actively rejoice; dancing in the streets and AK-47 fire. But I doubt that we will see that in our media. Is there any early word how the fine pipe organs survived or not? Last edited by jack11111; 16th Apr 2019 at 03:04. I would not be surprised to see the heavy oak structure survive relatively unscathed. I'm not familiar with the fire resistance of oak, but it isn't uncommon for jarrah and other Australian hardwood members to survive building fires that would leave steel members looking like licorice. I know of at least one building that was rebuilt using the original timbers. One can only hope that this is the case here. Sadly Jack unfortunately according to media reports this AM the main pipe organ is believed to be badly damaged. The few TV images I've seen so far show that surprisingly (?) at least a few parts of the structure and furnishings at ground level appear to be superficially intact but water damaged. Large sections of the vaulted ceiling are also still in place. As an aside, with regard to some of the inevitable schoolboy comments posted earlier that seem to always pop up when anything involving the French and bravery is concerned are involved, here's some footage of the Sapeur-Pompiers at work from an apartment block fire in Paris earlier this year..
Last edited by wiggy; 16th Apr 2019 at 07:45. Hmmm... Flying large aircraft around at low level over a major metropolis. At night. What could possibly go wrong?